Tried & Tested: Valentines Drinks - the perfect gifts for the perfect night in! Glorious salmon-pink rosé handcrafted at the historic cellars of Limoux. Celebrated winemaker Laurent Mingaud employs Champagne's méthode traditionnelle to craft his famous Limoux fizz, giving you mouthfuls of tiny bubbles - just like top Champagne. "I'm a massive fan of Rose wine but I don't often get to taste the fizzy variety. The taste was quite dry and the bubbles felt unusually tiny, making for a lovely drinking experience. This is a great drink to have with a romantic meal - we had it with steak, which was great, but we're no experts. We'd definitely buy this again for a special occasion. Apparently I should be saying that it's beautifully balanced and finishes on a Strawberry note but that means nothing to me! It tastes good, makes me look posh and made me feel tipsy - a winner in my book! Tails are a perfect way to bring some fun and glamour to Valentine’s Day, whether they’re shaking up a girls’ night in or impressing that special someone. The launch range includes the Espresso Martini, Mai Tai and Cosmopolitan all at 18% ABV. Note to self - must buy posh cocktail glasses for home! "I love a good cocktail when I'm out but the last time I tried to pull together a cocktail at home was a nightmare. For that reason alone, I was impressed with the whole concept of Tails (and slighty miffed Id not thought of it myself!) You just buy it off the shelf, add ice in to the Tails packaging and then just shake and pour. All the deliciousness of a cocktail but with out the faffing around (and in my case the mess!) Great fun, no mess - and delicious too. A fab idea for Valentine night." 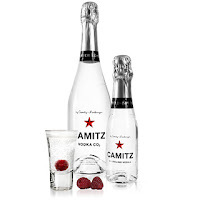 Camitz + Lindberger, distiller of Camitz Sparkling Vodka, has created a gift pack comprising a 200ml bottle of Camitz Sparkling Vodka (alcohol by volume, 40%), two shot glasses and a Camitz branded Champagne-type stopper. The pack is presented in a striking designer carrier bag. "I had never even heard of fizzy vodka before.. well... to a certain extent I'm used to Vodka being fizzy because I always drink it with Diet Coke but this is a completely new experience. The bottle has a champagne type cork so it makes it feel quite special. We had a shot (or two) and it was really good. I HATE vodka shots but this I can do - the bubbles make it so much smoother than just a shot a regular vodka. God, does that sound bad, I'm not a shot demon - I promise? This was brilliant. The only downside was that once the cork has popped the fizz disappears after 3 days - it still tastes good but the bubbles are gone. We loved it - great for a celebration - especially if Champagne's not for you." This is certain to win the heart of your loved one. Demijohn’s Raspberry Vodka is made from fresh Scottish Raspberries infused in Scottish Vodka. ....more For a really impressive drink, make sure you have a bottle of Champagne on ice. Put a dash of our Raspberry Vodka in the flute and pour on the Champagne. It can also be drunk on its own as an aperitif, simply pour over ice, or drunk as digestif after supper. "I love the whole idea of a deli for drinks. You choose the drink and which type of bottle you'd like to fill. 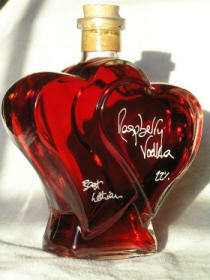 The raspberry vodka was delicious - we tried it on it's own as a chilled shot and also as recommended in champagne. It was great and would make a great romantic drink to share with your loved one this year. A lovely, thoughtful gift idea- much better than flowers - I'm hinting at the other half already."